2x more durable to power through your toughest cleaning tasks to help you achieve an exceptional deep clean throughout your home. Rated 2 out of 5 by thewhitehorse from Nothing stays the same I found Viva towels when visiting my Brother and wife in Savannah. They were great and soft and did not disintegrate in the wash. the other day while shopping I could not find them in the store because you changed your labeling. WHY! Along with the label change the texture has changed, they are not as soft. I use the towels as a giant tissue during cold and flu season along with allergy time. They now irritate my skin. You had the best product on the market why would you change. I have 1/4 of a roll of the old towel left and am treasuring it. I am hunting through town looking for old stock, who made this decision? I would like to meet him in a dark alley. Rated 1 out of 5 by AmandaV from Seems others are having the same issue! I’ve always used Viva paper towels as wipes for my babies! They are so soft and I just add water! They never get rashes from all the junk in wipes. Well we recently bought a couple packages and they are not the same at all anymore.. they are thinner and ROUGH! They are not soft at all anymore and, I agree with another person, it’s leaving lint behind. Viva was so soft.. I don’t know what happened! I just bought a huge package and I’m about to return. I hate saying I wouldn’t recommend to a friend, but this isn’t the same that I’ve always known and loved! Hopefully this gets figured out. Rated 4 out of 5 by jean 28 from Great product I have used these paper towels for years and love them but a few years ago they went from being extra thick and tissuey soft to being not as thick and soft. Even my friends have ask if I had changed the kind I was using!!! I spoke to you a few weeks ago and you said that there has been no change in making them and as a loyal customer I beg to differ and I don't use the advantage viva . Rated 5 out of 5 by Scarlet451 from Great product Great product from small to extreme large clean ups. Easy to use and absorbs liquids great. Makes cleaning a lot easier and faster and less messier. Will always use. Rated 4 out of 5 by Carollucy3039 from Soft thick & durable I like these papertowels because they're soft thick & absorbent. They work well to clean up spills, & messes. They're durable, & don't tear easily. The only thing I don't like is that they're dusty, they leave dust behind when cleaning mirrors, & glass. But are great for everything else. 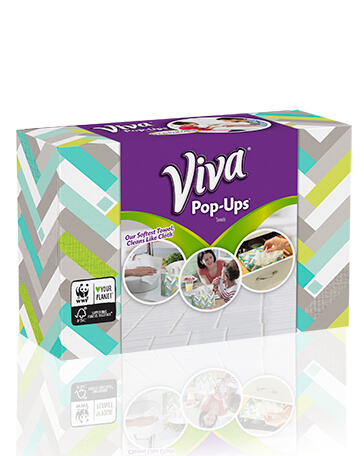 Rated 5 out of 5 by Michelle087 from Paper towels The viva signature cloth paper towels are more than just a paper towel! They are thick so you don't have to use as many, and they feel more like a towel and I think that they are more absorbent as well. I highly recommend these! Rated 4 out of 5 by yuku9242 from Great paper towel It was a great product definitely better than my usually paper towels.